Many of the residents here in Palm Beach love the look of their very own fence and entry gate. The gate can match their home’s aesthetic appeal in wood, glass or iron, while presenting a formidable barrier to unwanted guests to the property. These types of gates are typical for may homes found in Palm Beach, especially in the more established and distinguished neighborhoods. Have you considered installing an access control system to go with that gate? Imagine the feeling of coming to the front of the property to find an automatic gate guarding the entrance. Imagine the feeling that it gives to both the owner and the guest. To the owner, it’s a look of power and prestige, a look of status and privilege, a look of security and safety for the residents of the home. It also adds tremendous value to the appeal of the home in general. To the guest, it creates a different feel. If the guest is invited, it looks overwhelming and powerful. It presents an image of class and wealth in the house owner. If the guest is uninvited, it looks imposing and forbidding. It deters from making unwanted house calls or an attempt to breach the privacy of the owner. It presents a very clear message that the owners of the home are private people; concerned for their safety and security, and not willing that anybody should visit unannounced. What Type of Automatic Gate Do You Have? An automatic gate usually falls into two categories; sliding gates and swinging gates. Each one can be fitted with an automatic opener that operates entirely by remote access control. Let’s have a look at the implications and benefits of each option. If you have the common swinging gate that is seen so much around Palm Beach, having an automatic opener creates a dramatic entrance to your home to welcome you and impress your visitors. You only get one chance to make a first impression, so make it grand. We have the tools and expertise to install an access control system to any type of swinging gate, single or double-hinged design, wooden frame, and wrought-iron frame, ornate or basic. 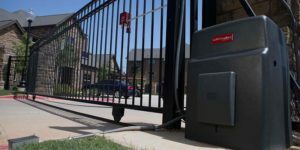 Even if you have an overhead-swinging gate on a garage or an underground section, we can install the right motor and track system to create an automatic swinging gate system that will meet your security needs. If you have a sliding gate, a motor can be installed to run the gate along the track to automatically open and close it with the push of a button. It’s a great effect to have a seemingly still gate suddenly slide open to permit access to you or your guests. Control your own home with an automatic sliding gate opener. In many ways, sliding gates allow for an added bonus of extra space. They don’t require the wide arc of a swinging gate and can be installed just about anywhere. Obstacles like bushes and trees don’t present a problem when installing a new sliding gate system. In our trade, we find that many newer homes have modern style gates while the older established homes have gates that are aged and well-used. It doesn’t matter what state of repair, or disrepair, the gate is currently in. We can repair the gate to function as smoothly as it was intended to be as we install the pillars, tracks, chains, motors and gears that automate the entire access control system. We know and service almost all the different types of fencing products there are. We’ve been installing a variety of gates for Palm Beach for over 60 years so we understand the market and what’s required for your home. 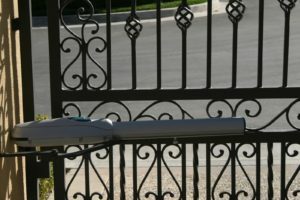 We know the value of a strong security system that controls entry and exit to your property as well as the curb appeal of a well-installed automatic gate. 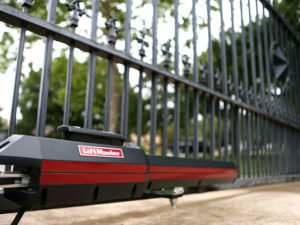 One of our most popular options is the automatic driveway gate. They operate without the driver ever needing to push a button and they can offer a seamless and smooth entry to your home. They are incredibly convenient and safe because it removes the option of forgetting to lock the gates after you leave. They close on their own so you never have to think about security again. Peace of mind with a simple automatic gate opener. It works by sensors buried under the driveway that sense an incoming vehicle. They can be programmed to upon the arrival of any vehicle or they can detect an automatic gate opener in the incoming vehicle and only open for specific cars. This type of security is best because it operates entirely in the background. There is no need for extra thought or effort to add an extra layer of security to the home. Our sensors can be installed under any type of driveway and allow the owner to be confident the gate will always open when they arrive, and then lock right behind them, leaving them free to think about more important things. 60 years installing automatic gate systems has left Budget Fence and Gate Systems with a abundance of experience available to you. We know exactly what works with each home, and the benefits you’ll receive from a professional access control system installation. We use trained and experienced technicians who will show with smile and strong commitment to your satisfaction. We depend on our customers to refer us to our next customers, and we can provide customer referrals of Palm Beach residents who have been satisfied with our work. Speak to one of our friendly and personable consultants to discuss your options. Talk to us about your existing gate or installing a new access control system. Don’t leave your home unprotected or poorly secured. Trust the experts to install an access control that leaves you and your family protected and safe. Call us today to book a free assessment for your gate and fencing.